When asked what they want colleges to emphasize most, employers didn’t put science, computing, math, or business management first. According to AAC&U’s 2013 employer survey, 95% of employers give hiring preference to college graduates with skills that will enable them to contribute to innovation in the workplace. 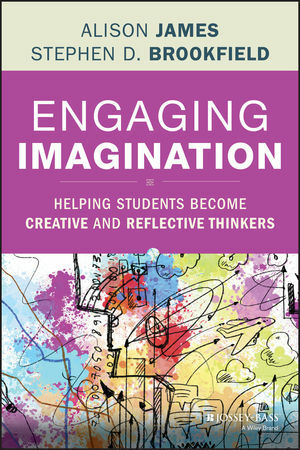 In Engaging Imagination: Helping Students Become Creative and Reflective Thinkers, two leading educators help college instructors across disciplines engage students in nurturing creativity and innovation for success beyond the classroom. Alison James, an expert in creative arts education, and Stephen D. Brookfield, bestselling author, outline how creative exploration can extend students’ reflective capabilities in a purposeful way, help them understand their own potential and learning more clearly, and imbue students with the freedom to generate and explore new questions. includes examples from a variety of disciplines and settings. Engaging Imagination is for college and university faculty who need to prepare students for the real challenges of tomorrow’s workplace. ALISON JAMES is a Principal Fellow of the Higher Education Academy in the UK and has worked in creative arts education for more than two decades. During this time she has taught students at all levels, run a learning support service, carried out extensive staff development on all aspects of pedagogy, and conducted research into student learning through personal and professional development. She has taught, written, and presented nationally and internationally on personal and professional development in fashion and the creative industries, emphasizing play and interactivity in reflective practice. Her publications on these and other subjects include a monograph, solo and coauthored book chapters, and journal articles. STEPHEN D. BROOKFIELD is the John Ireland Endowed Chair at the University of St. Thomas in Minneapolis, Minnesota. For more than 40 years, he has taught in England, Canada, Australia, and the United States. A six-time winner of the Cyril O. Houle Award for Outstanding Literature in Adult Education, he is the author of numerous books on teaching including Teaching for Critical Thinking (2011), The Skillful Teacher (Second Edition, 2006), and Discussion as a Way of Teaching (Second Edition, 2005), all from Jossey-Bass.